Forgiving is no easy task; in fact, it may be the most difficult endeavor one can undertake. St. Josemaria Escriva, the founder of Opus Dei, said, “I didn’t need to learn how to forgive, because God has taught me how to love.” Still, even this saint struggled with the trying task of forgiving. This collection of anecdotes from his life explores his experiences in offering and accepting forgiveness. Life as a priest in the midst of the violent Spanish Civil War offered St. Josemaria countless opportunities to practice forgiveness. Owing to an attitude of prayer, mortification, and total confidence in God, he was as immediate and resolute in forgiving in dramatic situations as he was in the ordinary circumstances of everyday life. He knew when a situation necessitated silence, and was always prompt in offering an apology when he found himself in the wrong. Readers will find themselves equally amazed and humbled by the gentle charity that contributed to St. Josemaria’s sainthood. 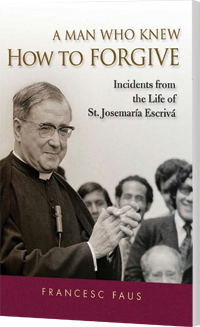 In addition to anecdotes from St. Josemaria’s life, this powerful introduction to forgiveness includes a biography of St. Josemaria, an explanation of the message of Opus Dei, excerpts from Bl. John Paul II at the canonization of St. Josemaria and Cardinal Joseph Ratzinger (later Pope Benedict XVI) at the beatification of Josemaria Escriva, and resources for further information in print and online.